Razor-N-Tape, the saviours of modern disco. Cut in Brooklyn, New York, they have perhaps been the most consistent label of the last 6 years. JKriv and Aaron Dae are the duo to thank behind the outstanding label, their hard work has seen them shape the new disco sounds running deep through the underground veins of New York City and beyond. They boast an extremely impressive repertoire of artists; Tiger & Woods, Jacques Renault, Dimitri from Paris, Late Nite Tuff Guy, Eli Escobar and disco don’s COEO are just a few of the wealth of talent who have released on the label. You’ll struggle to find a label with a better discography. Continuing a great start to 2018, the New Yorkers are set to bring out another stomper edits EP from Daniel T. Based in Los Angeles, Daniel regularly hosts ‘Crosseyed & Painless’ on Dublab where you can catch him every 1st and 3rd Wednesday, as well as being one half of Distant Works Records. Since his debut EP back in 2015 he has been going from strength-to-strength including an impressive release on Let’s Play House. His latest adventure with Razor-N-Tape is an African-infused disco EP, 4 perfectly produced stompers to get any basement or festival rocking! Today we’re delighted to premiere one of the best tracks on the release “All Day”. The wonky bassline and sweet vocals will viciously ear worm through your head long after you stop listening, complimented by some stellar percussion. 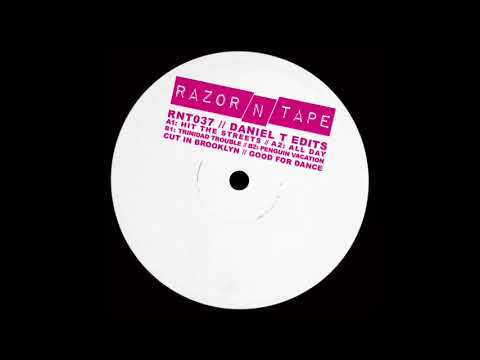 Go grab Daniel T’s Edits and every single other thing ever released by Razor-N-Tape.